One of your most powerful, yet ignored weapon in your marketing arsenal is your business card. Exchanging business cards with potential clients is, in fact, the most personal form of marketing. In this “tech-savvy” world, business cards are still essential for modern day businesses. There are many advantages of swapping business cards when compared to simply exchanging numbers. For starters, it is quite embarrassing and unprofessional when a client hands you their card and you have nothing in return for them. Rather than just being a contact in someone’s phone, a business card allows you to brand yourself. By presenting a client with a business card, you contain the ability of promoting yourself by means of text and visual cues. Production and printing costs of business cards are low and the benefits are high; as they make a statement in the business world. 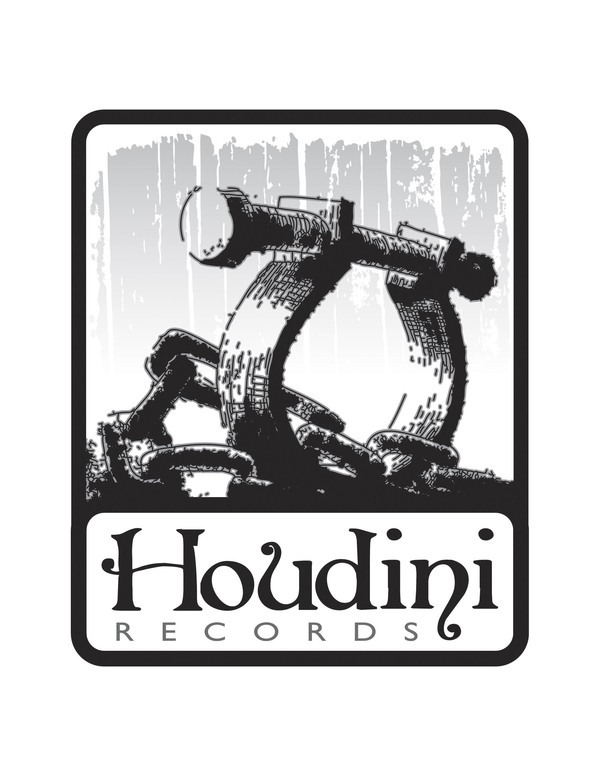 When done properly, a business card should convey both you and your company’s dominance. The color, content, design, typography, paper, as well as the size of a business card, will act as clear signals to a potential client about who you are and what you stand for. When creating a business card it is equally important to convey an important message, as well as have your card stand out amongst all the other cards. When designing a business card, the information contained on the card must include your first and last name, business address, email address, office phone number, cell phone number, the company’s logo, and a web address if applicable. Make sure that your name is the largest text included on the card so that potential clients can quickly discover your name when they look at your card. A business card should never just merely contain your name and information; it is important to include a tagline of what your company is capable of doing. It is important that the size of your business card must be no more than 3.5 inches by 2 inches. This measurement is the standard size of business card holders as well as the pockets found within wallets. If your business card is too difficult for the client to carry, then they will simply just throw it away if it does not possess the utmost importance. It is also necessary to always carry your cards in a card holder. Presenting a potential customer with a dog-eared business card will consistently give off a poor representation of your company. When addressing the content and design of your card, ask yourself, “What makes my card stand out from the others?” The fact of the matter is; your card is only one glance from ending up in a stack with all the others. If you choose to adopt a clean and simple design it does, in fact, show that your business cares about their appearance, but it doesn’t necessarily make the card stand out. On the other hand, over complex or cluttered designs tend not to scale well, can potentially lose detail when printed, and can even limit the writing space that clients often use to write notes on. 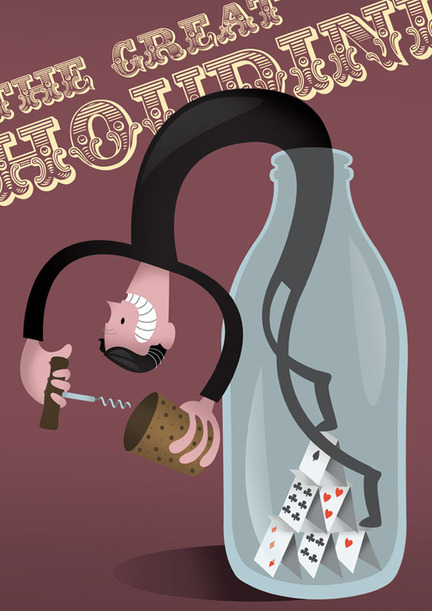 Finding the balance between content and design is essential when selecting your business card. 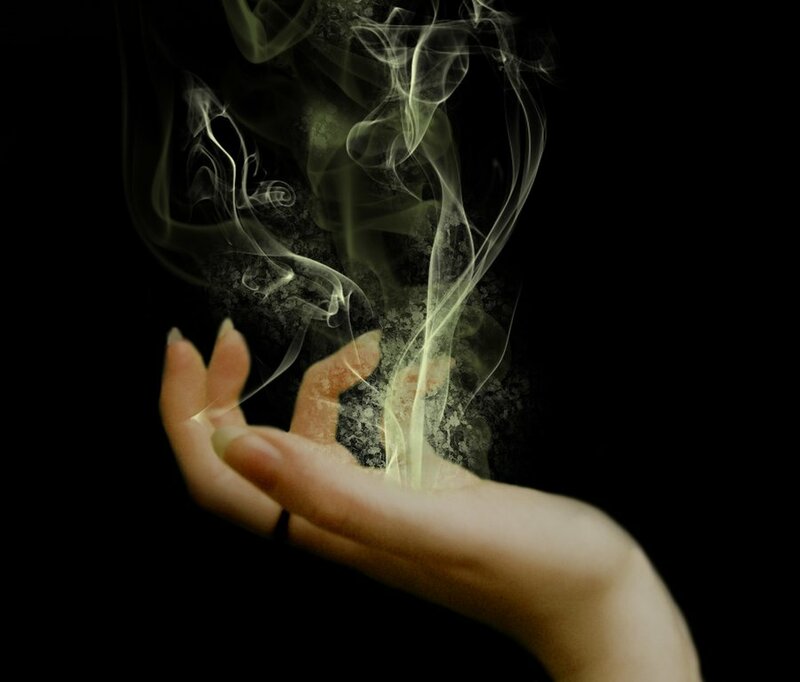 High creativity can possibly draw away a potential customer; that is if you are dealing with a serious client. However, choosing a material other than paper, containing angled cuts, altered corners, and interesting backsides can also be viewed as cool, modern, and innovative. This is important for people like artists or graphic designers who attempt to look trendy to their customers. 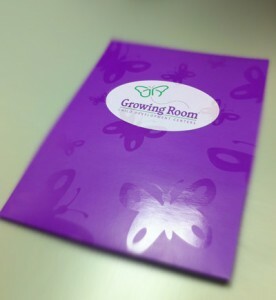 Smaller businesses tend to even put fun and interesting substances on their card so that their client will view it all the time. Some of these cards may contain a USB, a professional football schedule, or even magnets. When deciding which font to use and the spacing between texts, it is important to realize that legibility is absolutely essential. It is also important to understand that your choice of font will depict your personality and will speak the voice of your brand. Be aware that fun and modern fonts may undermine the severity of your company. 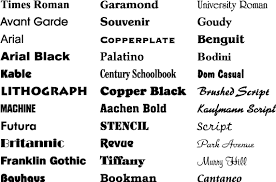 It is equally important to understand that decrepit fonts are sometimes difficult to read. Choosing the color of your business card can tell a potential client a lot about your charisma. When choosing colors it is again very important to understand that your card must be easy to read. Choosing a traditional color like white is very safe and conservative; however, it is difficult to stand out from all of the other cards. If one were to choose black, they are demonstrating power and seriousness however the color black can suggest mystery and can even intimidate the client. Similar to black, the color red is very powerful and passionate, but it too can intimidate the client. The color blue will often convey your message with honesty and trustworthiness, but it also represents calmness and tranquility which can be conceived as laziness by your client. 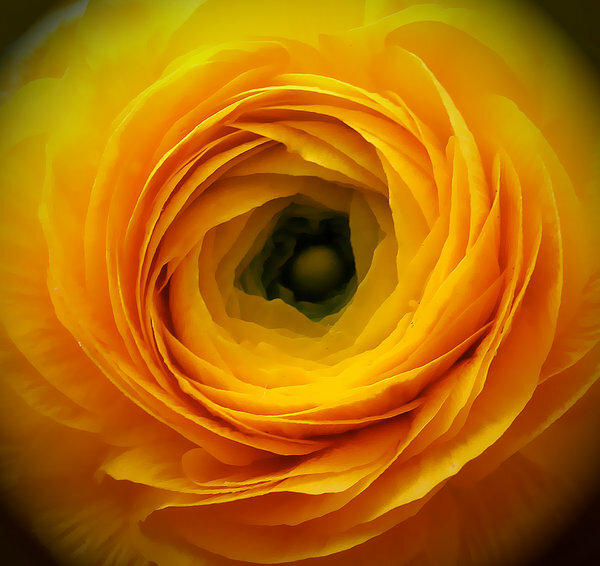 The color yellow is very uplifting and stimulates the mind; however, it can be strenuous on the eyes. So when choosing a color it is important to keep these things in mind. 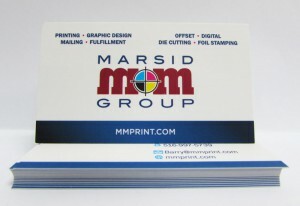 Now that you have an overall sense of how to create a business card, here at the Marsid M&M Group, we are ready to help and aid you with all your business card needs. We print any quality, as well as any quantity of business cards. Our experienced staff can even help you design your card to perfection. With our state of the art equipment; the finished good you receive will exceed all of your expectations. To get a free quote please visit our business card printing services and premium business card printing pages. Standard business cards are typically rectangular, 2 x 3.5 inches on white stock. The only thing that differentiates them from other business cards is the information and graphics. Adding custom finishes to your business cards bring them to life. The combinations are endless, but by using just one finishing option your business cards will be “Slicker than a harpooned hippo on a banana tree” (not entirely sure what that means but it seems to get the point across that your business cards will stand out!). Embossing your business cards is just awesome. This method has many variations from blind embossing to multi-level embossing to embossing with foil stamping. It gives your business card dimension, it makes you want to look at it from different angles. But best of all, if used correctly, it’s classy. 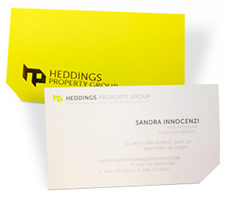 Foil Stamping enhances your business cards by reflecting light in the area where it is foil stamped. This reflection attracts the eye of the viewer. 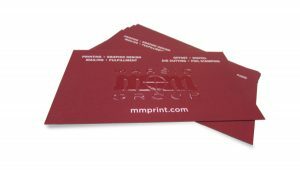 Foil is available in many metallic colors and even holographic patterns…if you want your business card to pop, this is the way to go! Spot UV coating creates a reflective mirror-like sheen only in areas where it is designated, hence the name “Spot” UV. 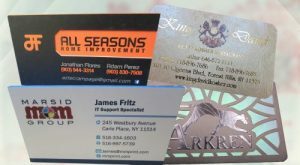 By using a spot UV layer on your business card, you can intensify the visibility of a certain graphic or even create a graphic out of the spot UV itself on a solid background. The example above have the 7 A.M. logo using this method so that the logo is only visible when angled to a light source. Very creative! Custom die cut business cards are the epitome of customization! The shape of your business card can be made to just about anything. Match the shape of your logo or product or you can add special folds to really make your business cards unique. 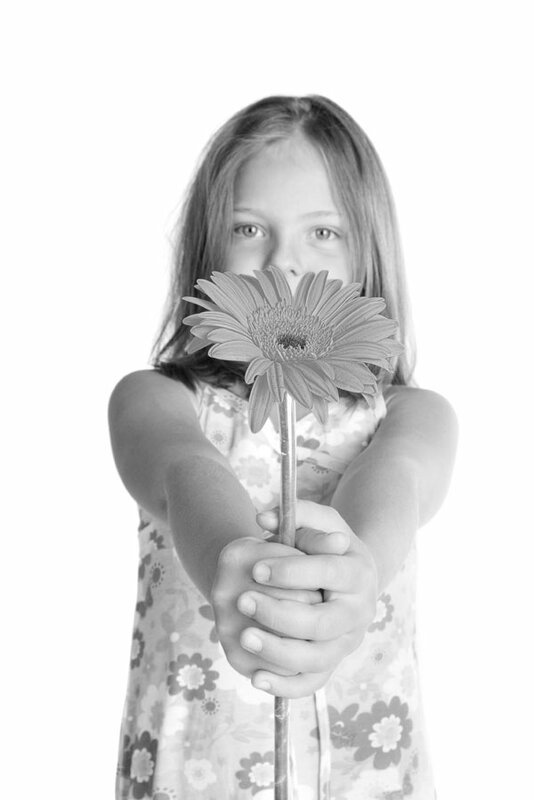 Give them something they will never forget! If branding is important to your company, making sure your brand is recognizable and memorable can be as easy as selecting a specific Pantone color for consistency This color is used throughout all of your marketing collateral and anywhere your logo/brand is displayed. Many (if not all) of the major brands do this. One of the most used examples is Coca-cola’s red. 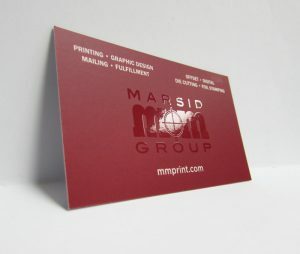 The more of these finishes you use on your business cards, the more they will stand out in a stack. I don’t think there’s any way of overdoing it. When used correctly your business cards will serve as a sales tool and conversational piece that can get the ball rolling on a new sale. Use them to feature a new product or to show prestige that reflects on your business. The variations and possibilities are endless. We strongly believe that an informed customer can make all the difference in print jobs going smoothly and without misunderstandings. I’m sure it goes for any industry. We strive to offer a unique and pleasant experience when working with us. 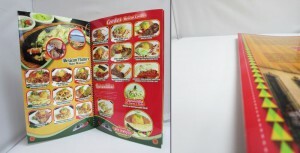 By providing our customers with informative collateral we not only educate our customer, but we also ease the lines of communication which instills confidence in our customer that what they are ordering is exactly what they want. It’s logical, it makes sense. With the recent popularity and practicality found in infographics, we decided to release a series of Quick Guides of printing terms and print related infographics to offer to our customers and anyone else who can use them. Please feel free to share this! For a more in-depth look at color, visit our Colorful Guide to Understanding Color. Pantone® has released a Quick and Easy installer for their Pantone Plus+® Digital Libraries for the Adobe® Creative Suite® (CS). This installer copies the necessary swatch files into the correct folders and replaces the original Pantone swatches included with your Adobe CS suite. Customers in need of design services are usually not knowledgeable of technical properties of design… that’s why they hire us to design it for them. More often then not, customer supplied files are not print-ready; product images and manufacturer logos pulled off of the internet, content written on a napkin, and anything else they can think of to make your job harder, but that’s why we charge by the hour, right? A good portion of design time is used in searching the internet for brand logos or finding product images that are suitable for printing. It is a burdensome task and takes time and patience. As an honest designer or design company, it is extremely important to be efficient while producing quality design. Your efficiency allows you to work faster and to be more precise, which in turn saves your customers money on design time and at the same time also helps produce quality design quickly so that you can move on to the next project. At the time of writing this post, Yahoo’s #1 search engine result renders a link to a Boost Mobile Samsung Galaxy Prevai™ spec sheet that contains a high resolution image of the phone. Another option to find high resolution product images is to begin by searching the company website for a Media section or search within the Site Map. Many corporations offer high resolution product images right on their websites for resellers and/or the media to use on their websites or print material. 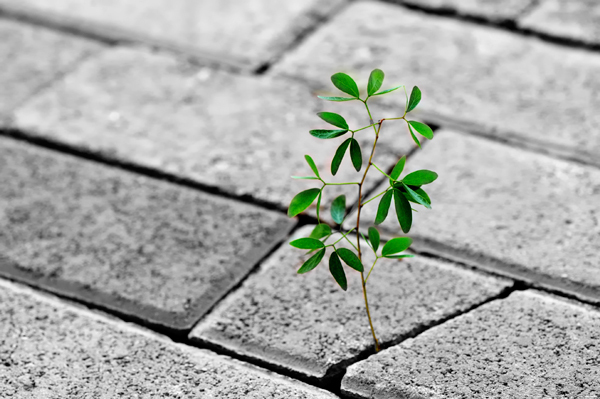 Corporations know that keeping consistent is smart business. Given this is the easiest and most convenient way of finding product images, not all corporate websites are created the same. Sometimes a high resolution image is simply not available online, at least not easily and you can’t spend hours upon hours finding one image. This option is a bit more time consuming but when your design quality matters to you and your client, then it is time well spent: Search the top three search engines for the product you are in need of and make sure to go to the “Images” section of each search engine. Many people and businesses take their own pictures of products with high megapixel cameras that render print-worthy images. Using Photoshop you can take the product right out of the picture and use it in your design. Make sure that your image is in CMYK format to avoid any color surprises when it prints. Adobe Illustrator and InDesign will accept RGB images to be placed within a CMYK document, but the document as a whole will be converted to CMYK at your printer. 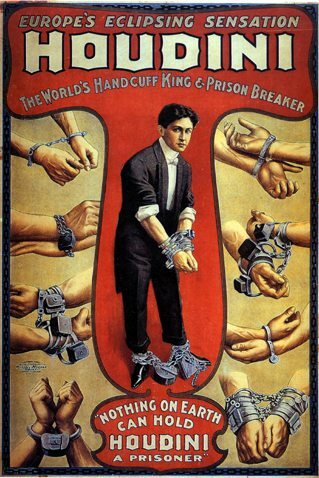 All brands and company names used here are copyright of their respectful owners. What cool tips or tricks do you use to find product images or logos when you don’t have them? As printers and print designers we are constantly submerged mentally and physically in the realm of CMYK. These four letters are the rule of the print industry and the basis for almost everything that we print. To increase your understanding of the CMYK color mode, please read our popular Colorful Guide to Understanding Color which explains color mode differences and why CMYK is used in printing while RGB is used for the web. Corporate logo designers know very well that a complete logo design package requires both PMS and CMYK versions of a logo so that all advertising mediums such as print and web are covered. This has mostly to do with color consistency. CMYK values that represent the PMS version should be determined to keep this consistency throughout all marketing campaigns (not to mention RGB for web graphics). Notice that almost all of the CMYK inspired logos above are Print companies or have the word Print in them. 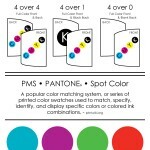 As I said before, printers and print designers are CMYK fanatics! What logos or other advertising have you noticed or designed that are CMYK inspired? As designers, the key is to keep the creativity fresh and inspired. Thinking outside of the box and out of the ordinary. 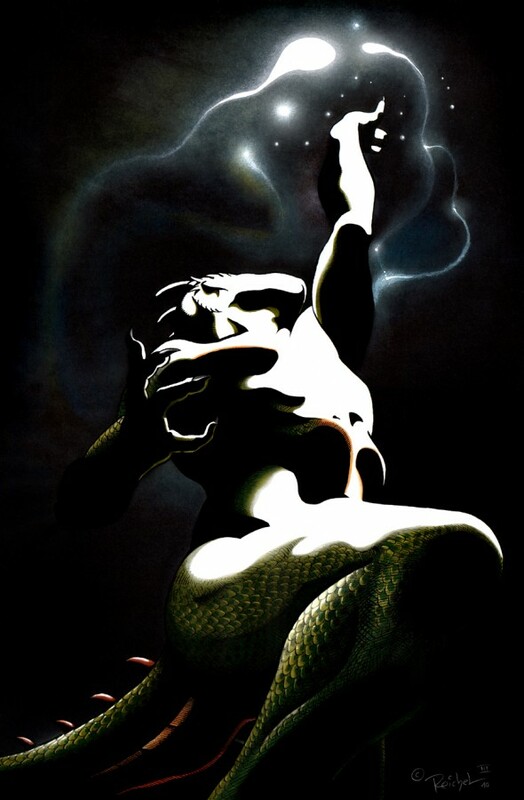 Yet his inspiration is suggestive of the inspiration that drives a graphic designer to keep designing whether for profit or not: To go beyond the norm and create or build fantasy where none is found. 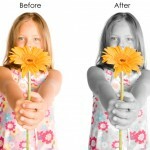 Photoshop Color splash is a method for emphasizing areas or objects inside of black and white photographs, with color. Very popular with wedding pictures and vintage photography, color splashing gives images an extra dimension of beauty: Color can be used creatively to change the perception of the image. 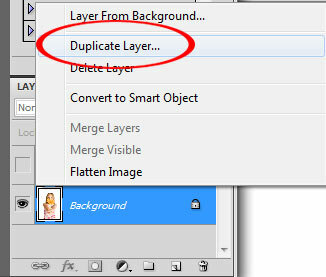 Right-click on the layer and click “Duplicate Layer…”. This will make a duplicate layer above the original. As you become more familiar with Photoshop you will find that keyboard shortcuts make certain actions faster to do than going through the menus and right clicking. With some practice it becomes a reflex such as typing; you know what keys to press without even thinking about it. 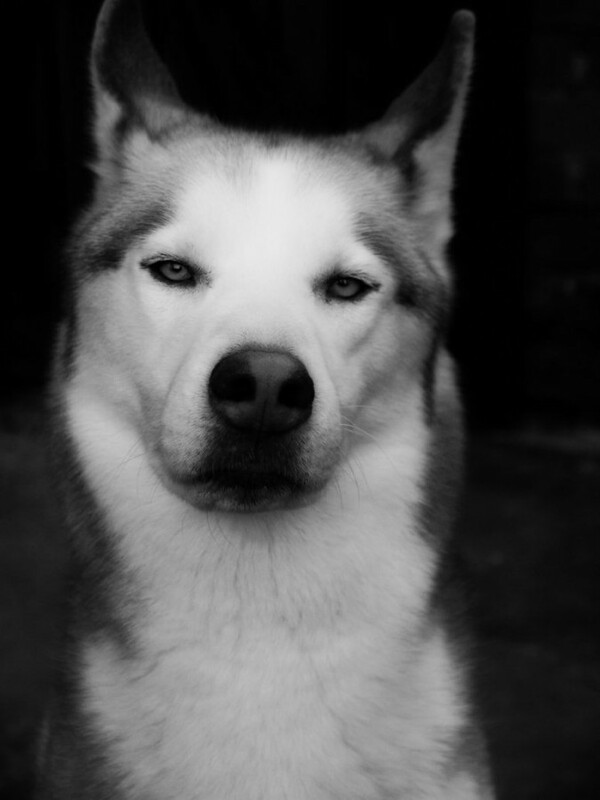 Desaturation is a different process in comparison to converting an image to grayscale or a black and white yet renders the same visual effect. 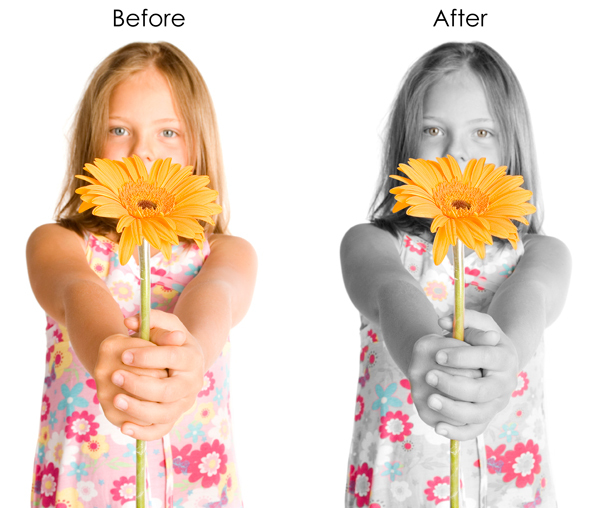 Desaturation occurs by pushing the CMYK values of the image towards their respective grey tone. *Make sure you have the new layer selected in the Layers palette. The History Brush Tool can be used to restore color and other attributes to an image from an earlier state in its history. 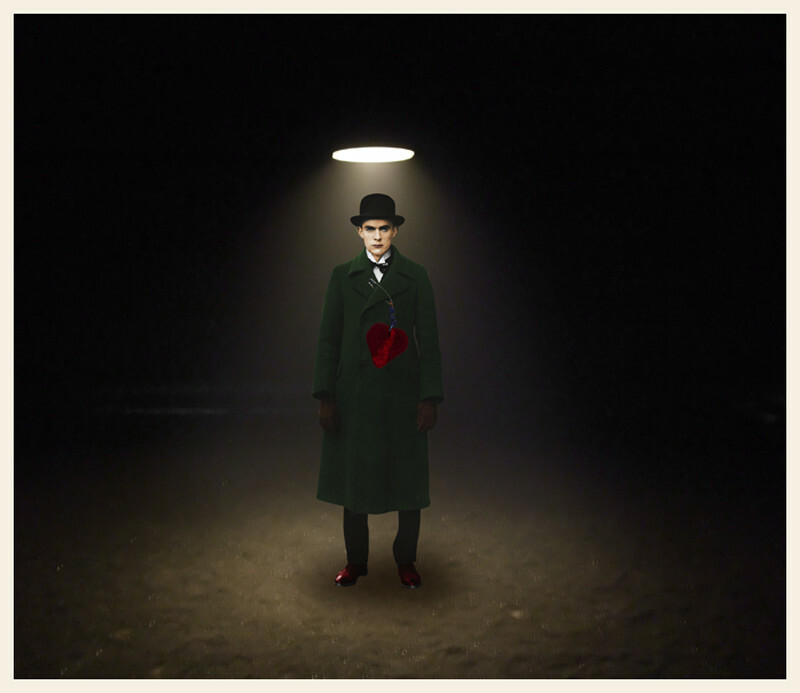 Once we desaturate the image, the original color becomes part of that image’s history. By using the History Brush Tool we can then selectively restore parts of the desaturated image to its original color version. In short, we are erasing the desaturation back to color except only where we want the color to appear. 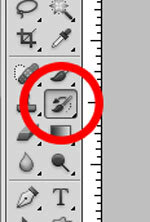 Select the History Brush Tool by clicking on it in the tools palette. 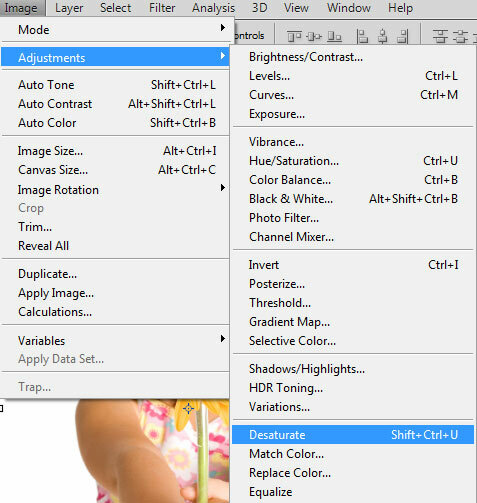 *Make sure your new desaturated layer is selected in the layers palette. 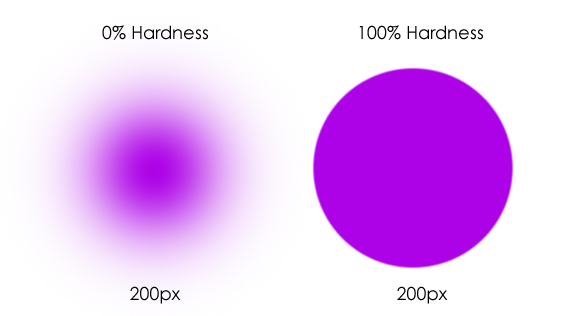 Begin by setting the brush size to 200px and 0% Hardness. Now you can begin coloring in the parts that you would like to have color. Adjust your brush size accordingly to get into those tight spaces and remember that you can zoom in to make sure you add nice clean details to your image. Experimenting with the history brush and different brush shapes for that matter can result in some unique and/or abstract photo manipulations. Show us your skills! 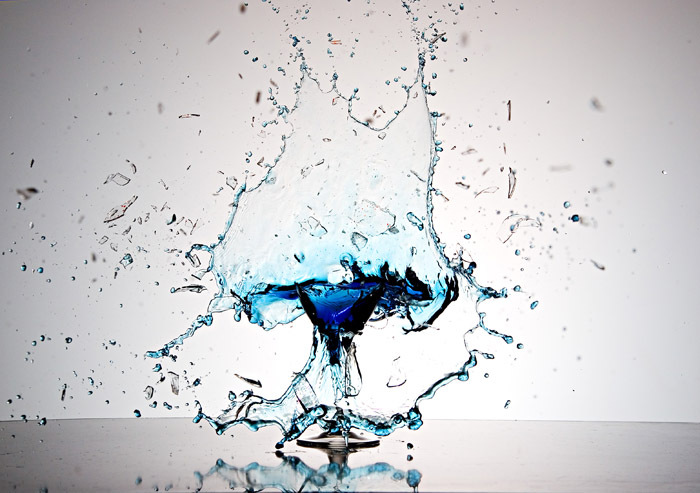 Tell us about your color splash project below..
We live in a world of Color. 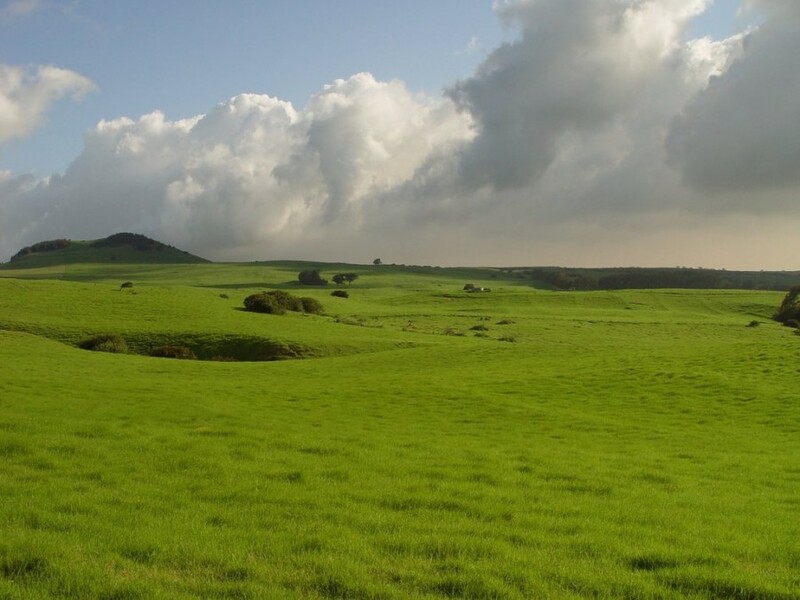 Everywhere you look color is influencing us consciously and subconsciously; naturally and synthetically: The blue sky, the green forests, the red stop sign, the green light. 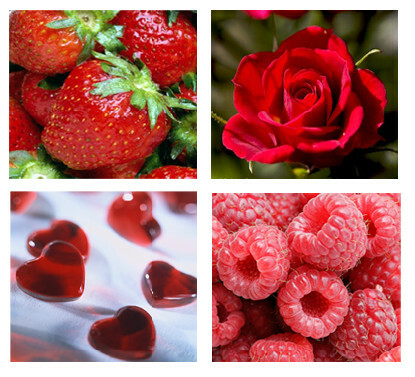 Color stimulates our emotions and motivates our decisions. In this article we will investigate what some colors represent and how they can be used in your design. 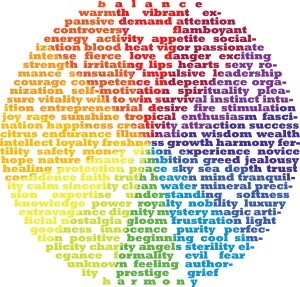 Marketing and advertising employs the knowledge and practice of color psychology in its work to drive results. 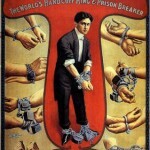 The main purpose of an ad is to motivate the viewer to take a course of action designated by the advertiser. Whether the call to action is to purchase a product, sign up for a contest or simply to modify the perception or mood towards a product or brand, color scheme is key to a successful campaign. Color is applied to the shape of a logo to represent an emotion, objective, a meaning, as well as to increase brand recognition. 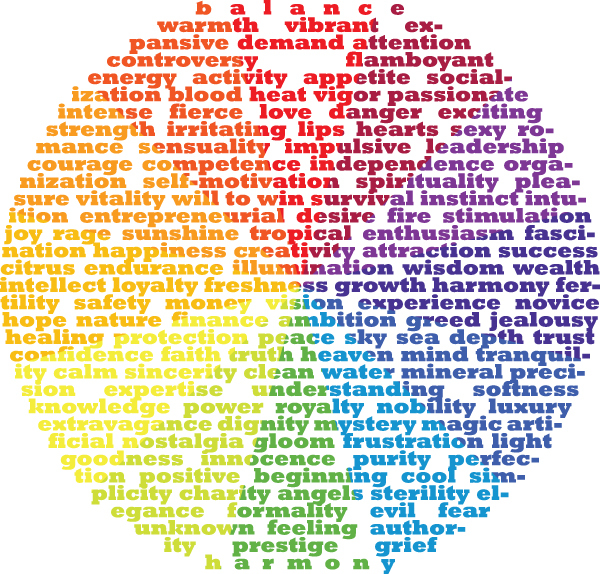 Colors can be presented and visualized as to signify verbs, circumstances, feelings, conditions, environments and objects to name a few. Make sure to use color to assist in getting your message across whether you are designing a sell sheet or a logo. Remember to keep in mind the perspective of potential viewers can make a difference in their perception of the design in its entirety. Not every color will affect every individual in the same fashion. It is possible that an individual experienced something involving a particular color and may react very differently from everyone else. It is important to investigate the potential hazardous impact that a color may cause when researching and choosing color schemes. This includes cultures and countries which may have a different meaning of colors. 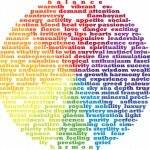 In what way do colors affect you? Have you used color in your workspace to help you be more productive?